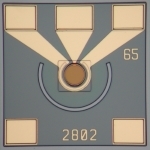 InGaAs/InP photodiode chip with a G-S-G pad configuration offering excellent responsivity at wavelengths of 850 nm and 1310 nm. The large optical aperture allows easy alignment to single- and multimode fibers. The top illuminated p-i-n photodiode is optimized for short-reach 850 nm and 1310 nm based high-speed data links up to 12 Gb/s. The device has a low capacitance and achieves full speed at low bias voltages.